… make sure your guest house is not at the top of a hill! It was a short and, as it turned out, easy leg from Matale to Kandy today. We thought we might have had tougher hills but to avoid traffic, we took a back road that followed the railway line that provided gentle grades. Dad’s Holiday Home had thoughtful staff and an excellent cook who whipped up a delicious dinner for the two of us last night: rice, beetroot curry, bean curry, dhal, a spicy omelette and a spicy salad with tomatoes, onions, cucumber, pineapple (stay with me), green chillies and a vinaigrette dressing – sounds a bit strange but it was irresistible. We had our best breakfast yet in an unprepossessing eatery in Ukuwela, a small village by a rail crossing. Our first train of the day bucked its way through on dodgy rails while the cafe opened up. 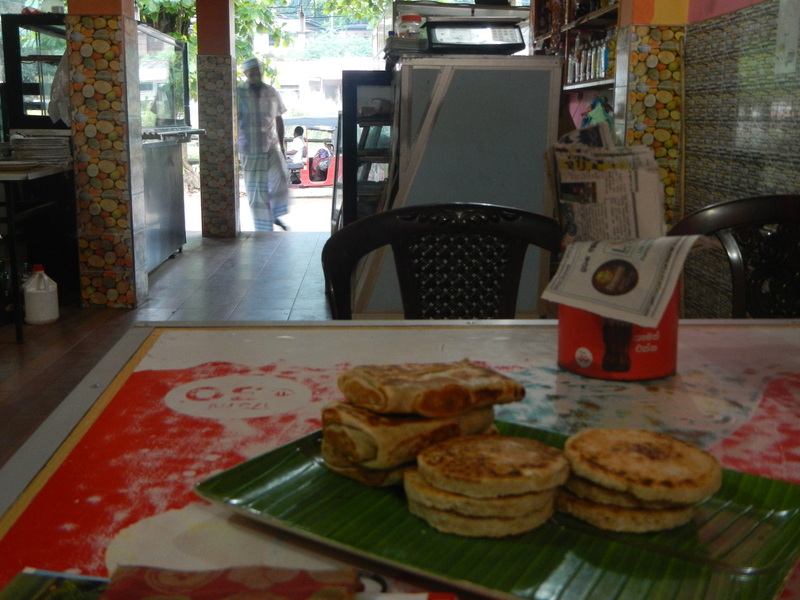 The roti man was already in full flap, the day’s batch of dhal had just made its entrance and the milky sweet tea was frothy, strong and piping hot. We ate several curry-stuffed vegetable rotis that were delectable. The vegetable roti required no adornment but the dhal lifted the coconut roti that otherwise were a bit of a dry argument. We then had a few kilometres of muddy roadworks shared with many children making their way to school in neat uniforms. Bright red ribbons were de rigeur for this school and they were very fetching in the girls’ raven hair. Many primary aged kids are apparently perfectly able to walk to school without parents hovering around. Wattegama, at about 500m, was the top of the climb and a busy place. We had a quick descent most of the way into Kandy but it was hot and sunny by then so lime juice and watermelon juice from A-One Cool Spot were just the thing. We poked around Kandy for a while. Saw another chained elephant and then headed for the Kandyan View Holiday Bungalow involving a climb of about 300m to a small, charmless, multistorey building on the top of the mountain next to some transmission towers. We were obliged to walk up a couple of severe grades. We were dripping wet when we arrived but the staff were welcoming and solicitous. We sat out two brief storms with lashing rain and strong winds during the afternoon and then took our bikes to the station, hopefully to travel ahead of us on the 3am freight train to Nuwara Eliya. We plan to meet them there tomorrow. What could go wrong? For some reason it’s impossible for the bikes to accompany us on the same train. 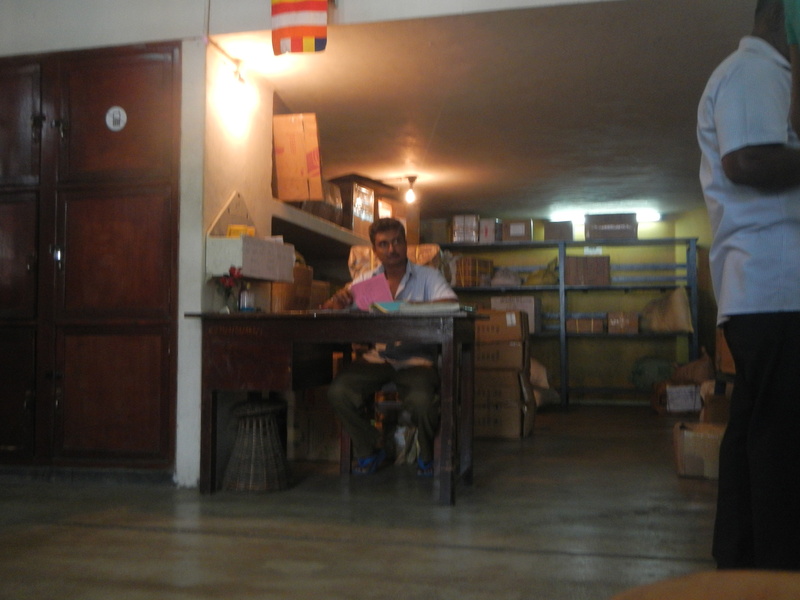 The administration of freight by the SL Railways seems almost Dickensian with hand-written ledgers and labels although the quadruplicate carbon copy forms must be a more recent addition. We ate spicy chick peas as a street snack (a spoon or fork would have been helpful) and drank beer in the pukkah Queens Hotel before observing the evening pujas at Kandy’s Buddhist Tooth Temple. Reputedly, one of Buddha’s teeth is a treasured relic there. Quite a crowd of locals and tourists was present to observe the ceremony with drums and a raucous horanawa (short, double-reed, oboe-like instrument). Time to sleep now to the sound of rain falling again. This entry was posted on 15 September 2015 at 5:11 pm and is filed under Sri Lanka. You can follow any responses to this entry through the RSS 2.0 feed. You can leave a response, or trackback from your own site. Your new calling Ian as travel writer. Susan Kurosawa move over.